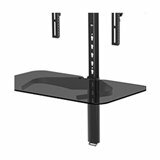 Marketing Information: This Glass shelf is easy to use and install, this shelf is designed to attach below any TV wall mount. Simply attach the double stud plate to the wall and attach the adjustable arm to hold the glass shelf. This unit will allow you install the glass shelf to your desired height below your TV. The ELGS will hold components up to 30 lbs. The adjustable arm has a cable management channel with cover to help you neatly hide all cords. Everything you need for mounting is included right in the box. If you have any questions about this product by Elexa, contact us by completing and submitting the form below. If you are looking for a specif part number, please include it with your message.